Get a free packet of crisps if you buy two 2L Cokes. 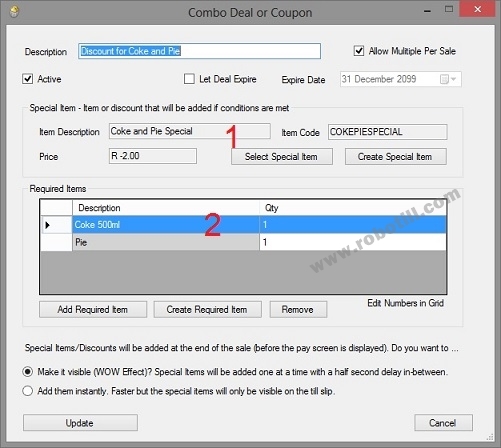 To set up a combo deal or coupon, open Manager and go to Stock > 'Combo Deals and Coupons'. 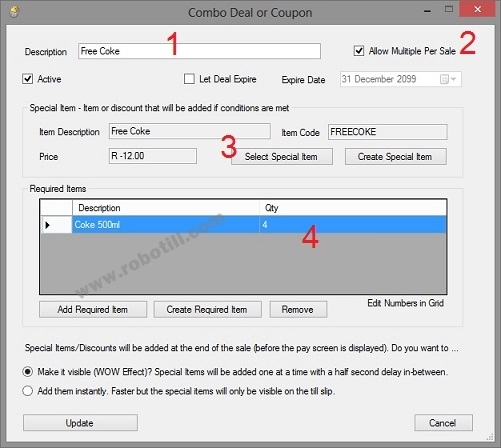 Each Combo Deal and Coupon work on the principle that some items are required (Required Items) in order to get a free item or discount (the Special Item). The Description is only used in Manager and will not be displayed in the POS application or the till slip. You can allow multiple deals per sale or restrict it to one per sale. For this example, if a person purchase 6 cokes you he will receive two free as 'allow multiple per sale' is selected. In this example, the Special Item will be a free coke. You create a stock item that is called 'Free Coke' and give it a price of the negative value of a coke. The required items is a Coke with a Qty of 4. Note, although the customer must only pay for 3 to get a free one, 4 cokes must be scanned (the free one included) before the 'Free Coke' Item will be added. At the end of the sale, one coke will be deducted (free item will be added) if 4 cokes or more are scanned. For a discount price, you need to create a stock item for the negative value of the discount. For this example, if a Coke is R 12 and a Pie is R 15 (total of R 27), and you want to offer the combo deal for R 25 (R 2 discount), then you create a discount item called 'Coke and Pie Special' with a price of - 2. As the special item you add the 'Coke and Pie Special' item as explained above. The required items will be a Coke and a Pie. If both items are scanned, the special item will be added. For the special item you create a stock item with the discount price of the coupon. It is not the coupon item but the discount of the coupon. For this example we will call it 'Dog Food Coupon Discount' with a negative price of -2. You need to add the actual stock item the coupon is for (the Dog Food). You then need to add the coupon. The coupon will be a stock item with the barcode/stock code that is on the coupon and a price of zero (no price). If a coupon is scanned and the required item is also in the sale (the dog food), then the coupon discount price item will be added.